Today, far too many people still associate the thought of orthodontic treatment with metal brackets, silver wires, and colored rubber bands. While this traditional technique for straightening teeth is still going strong, there are actually other options available today that allow adults to improve their appearance without having to sacrifice their confidence for months or even years at a time. Dr. Ronan Freyne offers both Invisalign and Six-Month Smiles to patients in need. Please contact us today if you’d like to schedule an orthodontic consultation, or if you have any questions our team can help you with. Much like the name suggests, Invisalign is an extremely subtle and convenient method for correcting mild to moderate tooth crowding or spacing. This treatment option relies on the use of clear, customized aligners that are removable, with each one representing a different stage of your smile’s gradual shift. The patient is instructed to wear each one for a period of about two weeks before switching to the next aligner in the set. Additionally, you will need to visit Dr. Freyne’s office every six weeks on average so that our team can assess your progress and ensure that the treatment is going smoothly. In most cases, patients can expect to be finished with treatment in 9-15 months. When worn, it’s virtually impossible to see the Invisalign aligners unless you already know what to look for. This means that patients can continue to smile, laugh, and enjoy each day to the fullest without constantly worrying about their appearance. In addition to being attractive, the aligners are fully removable. This allows you to continue to eat all of your favorite foods without restriction and brush and floss normally as well. The lack of brackets and wires results in far less irritation to the oral tissue and much more comfort overall. There are no unpleasant tightening appointments to worry about, either. 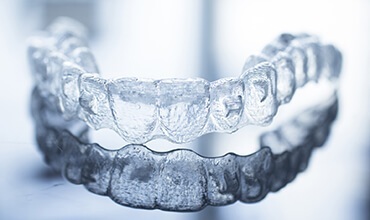 Invisalign treatment is planned virtually, which means patients can see how their straight teeth will look before they even start wearing the aligners in the first place! Six Month Smiles is another treatment option where the name is indicative of what patients can expect. This new orthodontic technology focuses solely on the teeth that show in your smile, which allows us to improve their alignment much faster and more comfortably. Most patients are completely finished with their treatment plan after just 4-9 months, with six months being the average – that’s a significant improvement over the multiple years that traditional braces can often require! If you’re worried about how your Six Month Smiles braces will look throughout the process, you don’t have to be. This advanced technique uses clear brackets and tooth-colored wires that are far less noticeable against your smile than the original models, which allows you to keep smiling brightly from day to day.